4.1 Advertiser: The Second Party/Advertiser is a publisher / seller / marketer of books etc. 4.2 Advertisement: The Advertiser is desirous of publishing advertisement related to its products and business in different Medias, including but not limited to print, audio-video, internet/web etc. and as such in search of a ‘Model’ fit for its advertising purpose. 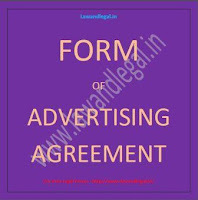 4.3 Grantor: The First Party is a ‘Model’ and engaged in such profession and has become interested to act as an ‘Model’ in the advertisements to be published/released/displayed by the Advertiser as aforesaid. 4.4 Discussions and Negotiations: Discussions and negotiations have taken place between Grantor and Advertiser and essential terms and conditions in this regard have been finalized and agreed by and between the parties. Be it mentioned here that the Grantor has represented and confirmed that she has not participated in any advertisement in respect of any similar products or business as of the Advertiser. 4.5 Agreement: The parties hereto are interested to put the said terms and conditions on record by these presents. Conclusive and comprehensive terms and conditions superseding all previous documents and understandings contradictory hereto, if any, are now being recorded by this Agreement. 5.1 This agreement shall be deemed to have commenced on and from _______ (DOC) and shall remain in force for a period of ___ months form DOC (Term). 5.2 The Grantor herby grants to the Advertiser for the said Term the right to use the Grantor’s name, photograph (printed/digital), biographical material in advertisement/s to be published or displayed in different medias as described in the Schedule below relating to the products and business of the advertiser of the description also described in the said Schedule. 5.3 The Grantor also agrees to participate in ad-film shooting and photo-shoots of the Advertiser as aforesaid as and when required by it during the Term, provided the Grantor has been served with notice of one week in advance for that. The Grantor shall make herself physically available at her cost in such occasions in time without any default at such places that may fixed by the Advertiser from time to time. 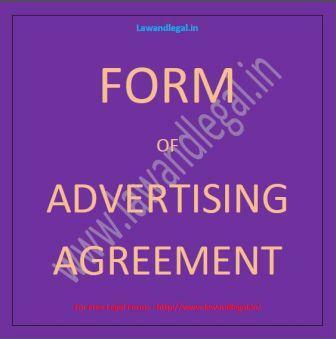 5.4 The Advertiser will indemnify the Grantor against all expenses costs proceedings and liability in respect of the publication or exhibition of such advertisements. 5.5 During the Term hereof the Grantor shall not advertise or participate in any advertisement on behalf of any other party similar to the product or business of the Advertiser. 5.6 The Advertiser has paid to the Grantor on the signing of this agreement a sum of Rs.______/- (Rupees _____________) only in consideration of the right granted under clause 5.2 hereof and as the consolidated total remuneration for the purposes of this agreement, receipt whereof the Grantor doth hereby as well as by the receipt and memo hereunder written, admit and acknowledge. Be it clarified that the Grantor shall not have any further claim or demand whatsoever from the Advertiser. 6.1 Revocation of Previous Understanding: This Agreement is the only contract and understanding between the Parties. All previous discussions and writings, if any, stand revoked and replaced by this Agreement. The provisions of this Agreement shall remain binding upon the Parties unless modified in writing by bilateral instrument. 6.2 Language: All documents to be furnished or communications to be given or made under his Agreement shall be in English Language. 6.3 Custody of Agreement: This Agreement shall be printed in duplicate and each of the parties shall keep a duly signed and sealed copy thereof, which shall be treated as original. 7.1 Mode of Service: Except as otherwise expressly provided herein, all notices shall be in writing and shall be transmitted by pre-paid Registered Post at the addresses of the Parties mentioned hereinbefore. 7.2 Change of Address: Either Party may from time to time change her/its address for receipt of notice or other communications provided for in this Agreement by giving to the other not less than 15 (fifteen) days prior written notice. 8. Arbitration: Disputes arising out of this Agreement shall be referred to the sole Arbitration of a single Arbitrator (Sole Arbitrator), being a reference within the meaning of the Arbitration and Conciliation Act, 1996. 9.1 Number: Words denoting the singular number include, where the context permits and requires, the plural number and vice-versa. 9.2 Headings: The headings in this Agreement are inserted for convenience only and shall be ignored in construing the provisions of this Agreement. 9.3 Definitions: Words and phrases have been defined in this Agreement by bold print and by putting them within brackets. Where a word or phrase is defined, other parts of speech or grammatical forms of that word or phrase shall have corresponding meaning. 10.1 In Witness Whereof the Parties have executed and delivered this Agreement on the date mentioned above.